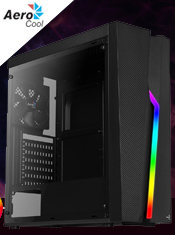 CiT Blitz is an excellent solution for PC gamers with limited space, plastic front panel with RGB fans give the excellent design feature to this case. The full acrylic side window and black coated interior and exterior enhances any LED lighting used within your system. 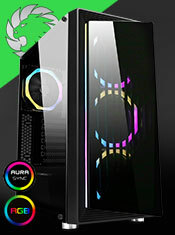 The cooling system consists of 1 x 120mm Single-Ring Halo RGB fan at the top, 1 x 120mm Single-Ring Halo RGB fan at the rear. Along with the internal cable management, allowing for increased airflow through your system, which will aid in cooling. The PSU intake comes from the external part of the case at the bottom, thus aiding in the PSU running at its optimal temperature. With the I/O Panel giving you easier access to the 1 x USB3.0, 2 x USB2.0 and HD Audio (Headphone and Microphone), allowing for connection to a wide variety of devices. Please note the main image shown is for visual purposes only. The fan included is RGB (solid RGB colours only) and not a spectrum fan (where the colours merge). I/O Ports - USB2.0 x 2, USB3.0 x 1 and HD Audio. Side Window - Full acrylic window allows you to show off your internal components easier. Front Panel - Plastic front panel with RGB lights coming from the top and back of the Blitz, there is an LED button on the front panel so the user can cycle through the different colours. Fan - 1 x 120mm Single-Ring Halo RGB fan at the top and 1 x 120mm Single-Ring Halo RGB fan at the rear. Removable Dust Filter - A dust filter on the top of the Blitz helps to prevent dust from getting into your build and helps improve the performance of your chassis.